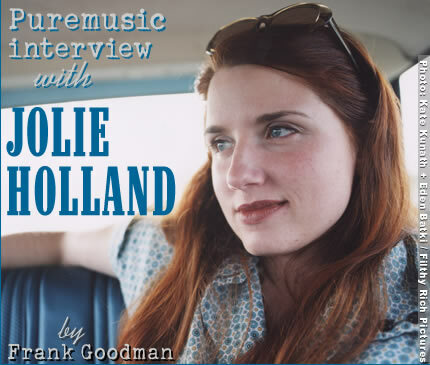 Texan by birth, gypsy by nature, Jolie Holland is quietly carving a niche for herself in the musical landscape. She and Samantha Parton crossed paths some years back, a meeting that ultimately culminated in the forming of The Be Good Tanyas. She bugged out after the first record was done, but her co-write "The Littlest Birds" remains one of their most memorable and radio worthy songs. There were any number of old-timey artists and outfits percolating under the radar as Gillian Welch & David Rawlings and then the whole O Brother phenomenon unpredictably captured the ears of millions of people. Some of those artists like Jolie and the BGT also had a lot of Jazz and Blues influences in their sound, and less Bluegrass per se. But in both of these cases at least, it's a more primitive and sound texture approach to the music that prevails, rather than the flashy or chops type approach that either jazz or bluegrass tends to incorporate. In the case of Jolie Holland's music, there are some very good players in the mix who take a decidedly textural and ambient approach to the material, creating a very unique and appealing atmosphere. Dave Mihaly's touches on the drums, percussion, and marimba, Enzo Garcia's musical saw and banjo, and Bruce Miller's tremoloed guitar lines interweave and coalesce with the sound of Jolie Holland spectrally. And well they might, since the artist seems to channel the singing and playing of another time herself. The lyrics get pretty modern in vituperative spots, but the writing voice is the mystic she calls herself, the urbane wanderer. Whatever you call it, or her, she's making great and unusual records. Many offbeat luminaries are among her admirers, we'll add our names to that list unabashedly. We were very enamored with the unintended debut called Catalpa, which caught on regardless of its low-fi personality (see our review), and no less impressed were we with its more legitimate sister record, Escondida. Be sure to catch her show when she comes to your town, and we hope you enjoy (as we did) this recent phone conversation with Jolie.